Agritourism business supports hunger relief by donating portion of ticket sales and merchandise proceeds to Oregon nonprofits. PORTLAND — While a growing push to link consumers with their food has become the norm, one Oregon agritourism business is stretching the local food movement further by sharing its proceeds with the hungry. 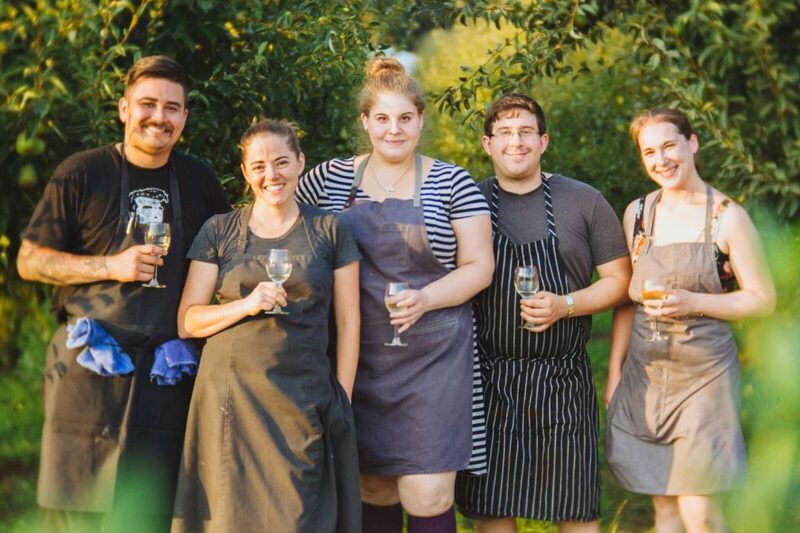 Every summer since 2003 Plate and Pitchfork has offered on-farm, gourmet meals around Oregon featuring tours of the land the meal was harvested and an opportunity to interact with the host farmers. Since its inception, Plate and Pitchfork has shared a portion of its profits. “Plate and Pitchfork has always supported hunger relief — in the beginning we divided our support between hunger and environmental causes,” founder Erika Polmar said. As her business grew and the message of eating locally produced food became well known, Polmar said she wanted to make a more dramatic impact by sharing her profits with those who don’t get enough to eat. “One-in-five Oregonians is food insecure,” Polmar said. For the past six years a portion of ticket sales and profits from merchandise were sent to Farmers Ending Hunger, a group that solicits crop donations from farmers for the Oregon Food Bank. In 2016 those donations added up to more than $22,000. A donation of $150 to Farmers Ending Hunger is a year’s supply of fresh vegetables for a family of four, providing Polmar a way to make the dramatic impact she sought. “I wanted to work with them because they are so cost efficient with so little overhead,” Polmar said. John Burt has served as Farmers Ending Hunger’s executive director for 10 of its 11 years. The retired Oregon State University extension agent said in 2015 his group helped get more than four million pounds of donated food to the Oregon Food Bank and 3.5 million pounds last year. “We help get food from point A to the food box,” Burt said. Potatoes and onions make up half of the fresh food that Farmers Ending Hunger steers to the food bank, totaling one million pounds each. A major cherry producer in the Columbia Gorge is donating nearly 100,000 pounds, delivering bins every week during the season a large cattle farm donates hamburger. A lot of the crops, such as carrots, green beans, carrots or beets, are frozen or canned at Norpac. At planting time Burt said Norpac knows how many acres of crop to expect. Three years ago a wall-size display featuring Farmers Ending Hunger was installed at SAGE Center in Boardman, a sustainable agriculture and energy interpretive center. The center’s interactive displays describe the food and energy businesses at the Port of Morrow and their impact on the region. “To be asked to have space on the wall felt like we’d arrived,” Burt said. For Polmar, finding worthy causes to share her profits was easy, but collecting more than 100 donations from each of Plate and Pitchfork’s events was generating an administrative nightmare for nonprofits with small staffs like Farmers Ending Hunger where Burt is part-time, running an entire program on roughly $125,000 year. To alleviate the paperwork burden for the organizations she supports, Polmar started the Plate & Pitchfork Fund to End Hunger in 2017, under the umbrella of the McKenzie River Gathering, a community foundation. The donations go into the fund throughout the summer months and at the end of the year checks are cut to different organizations. “This was the first year we awarded $15,000 to Farmers Ending Hunger, $1,000 to Lower Columbia School Gardens and $3,500 to Community Connection of Northeast Oregon’s food bank,” Polmar said. Polmar is preparing her 2018 Plate and Pitchfork calendar, on-farm meals with a story and a mission. “When guests come to dinner this year a portion of their ticket and merchandise purchases will benefit the fund and awarded to Farmers Ending Hunger and other organizations finding creative ways to solve Oregon’s hunger crisis,” Polmar said. To learn more about Plate and Pitchfork’s fund visit www.plateandpitchfork.com. For more information on Farmers Ending Hunger, visit www.farmersendinghunger.com. 1 in 5 Oregonians currently rely on food stamps.